When you meet someone, do you smile? Or do you hide your teeth? If yellow or stained teeth are keeping you from looking and feeling your best, bleaching is a safe, quick, at-home process that whitens your teeth. Bleaching is tough on stains and gentle on teeth. Stains in the outer layers of the tooth can be removed, such as those from tobacco, tea, coffee, or food. Antibiotic stains and discoloration from injuries may take longer to bleach and not respond as well. Bleaching will not change the color of existing fillings or crowns, and it's not recommended if you are pregnant or breast feeding. There are two options: take home bleaching trays or In-Office Zoom! Whitening. 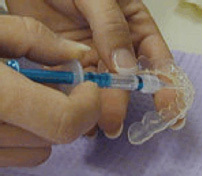 Take home bleaching tryas are a simple process that you do at home following your dentist's instructions. First, your dentist examines your teeth, then molds are made of your teeth. Finally you are given your bleaching trays and gel. Most people wear the trays with gel two times a day for 20-30 minuets each time, for about 2 weeks. This can vary patient to patient. Zoom! Whitening is in-office whitening system that can bleach your teeth up to 8 shades in under 90 minutes. Call our office today to schedule your appointment and visit www.zoomwhitening.com for more information. What am I to Expect? You will probably notice that your teeth begin to look whiter within a few days. Some teeth can be harder to bleach than others. You can discuss the results at your follow-up visit. How Do I Keep My Teeth White? Don’t Smoke - Smoking stains the outer layers of your teeth, causing them to turn brown. Avoid Foods and Liquids that Stain – For example: wine, tea, coffee, and some foods, such as berries, can leave stains on your teeth. Brush and Floss - Done twice a day to remove plaque. Plaque turns to tartar which can discolor your teeth. See your Dentist- Regular checkups and cleaning remove plaque and tartar and keeps your teeth white and free of decay.